Princess cut diamonds are quite popularly used in jewelry. Many clients want a GIA certified princess cut diamond as their center diamond. 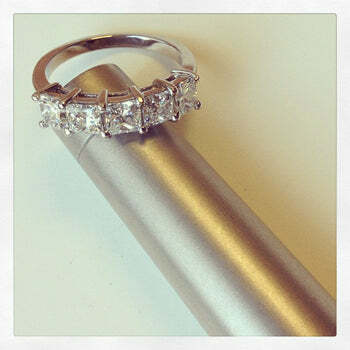 However, many clients also want a wedding band that features princess cut diamonds. Here is a little more info on princess cut diamonds… You can read here to learn more about princess cut diamonds and what to look for when shopping for one. This 2.00cttw princess cut five stone diamond ring features diamonds that are G-H color and SI clarity. Each diamond weighs 0.40ct and is hand set into the shared prong setting. If you have a princess cut solitaire ring, this could be a great band to complete your bridal set. Keep in mind though that each diamond here in this ring is fairly large so if you need to scale down the overall total carat weight, we have smaller options available for you. 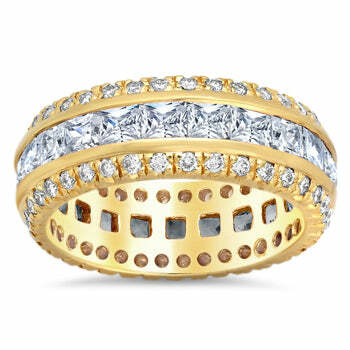 If you want to add a little color to your princess cut channel set band, look no further! 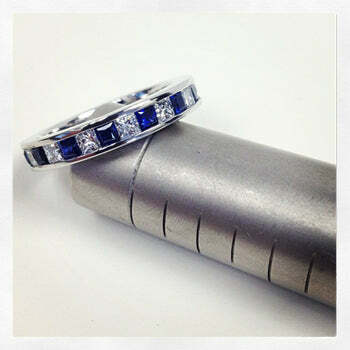 This ring features alternating princess cut white diamonds and blue sapphires weighing approximately 2.25cttw. I absolutely love the contrast between the white diamonds and the deep, gorgeous blue color of the sapphires. At 3.5mm wide, this is a great band width that can be worn alone or alongside your engagement ring. If you are looking for a statement ring that features princess cut diamonds, look no further! This channel set princess cut diamond ring with round diamond accents features approximately 3.75cttw diamonds. Coming in at 7.5mm wide, this could be your engagement ring and wedding band in one or you can wear as a right hand ring. This is one of my favorites! Remember to consider princess cut diamond wedding bands when shopping around! Here at deBebians, we have lots of different styles and variations and if you do not see what you love, we can always custom make anything for you. Happy shopping!